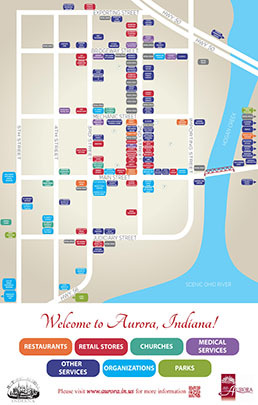 *City of Aurora Wayfinding Map provided by Main Street Aurora, who is happy to have been able to design and fund this important aspect of downtown revitalization. Angela's Attic 210 Main St.
Clark's Liquidation 315 Second St.
Impact Sports 718 Green Blvd. Saved By Grace 401 Second St. The Wood Shop in Aurora 401 Third St. Duds & Suds 118 Main St.
Lawrence Motorsports Auto 621 Green Blvd. 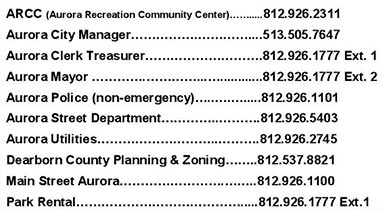 Landwater Group, Inc. 201 Bridgeway St.
Aurora Church of Christ 814 Sunnyside Ave.
Methodist Church 9670 Mt. Tabor Rd. New Hope Baptist Church 116 Church St.
River Valley Community Church 325 Washington St.
Aurora High School Museum 232 Main St.